Background: Cyclophosphamide and mycophenolate are the currently proposed first-line agents for induction in lupus nephritis (LN). In this study, we analysed the response rates with the three different induction regimens currently available for LN. Methods: Patients with biopsy-proven LN with data available at least till completion of induction regimen was included. Data on demography, clinical, laboratory measures, disease activity, and treatment received at baseline, at the end of induction, and until the last follow-up were retrieved. Response at the end of induction was noted. Differences between groups were analyzed using Chi-square test. Results: Eighty-three patients (75 females) with the mean age of 25 ± 8.9 years were included. The median duration of follow-up was 18 months (range: 6–153). Forty-one patients had Class IV, 19 Class III, 11 Class V, 7 Class III/IV + V, and 5 Class II LN. Forty received high-dose cyclophosphamide (HD CyC), 14 Euro-Lupus Nephritis Trial cyclophosphamide (ELNT CyC), 20 mycophenolate mofetil (MMF) for induction, while two received azathioprine, one cyclosporine, one modified ponticelli, and five with Class II nephritis received no induction. Baseline characteristics were comparable between three groups. The response rate was similar between the three groups: 30/40 in the HD CyC group, 12/14 in the ELNT CyC group, and 15/20 in the MMF group responded at the end of induction (P = 0.69). 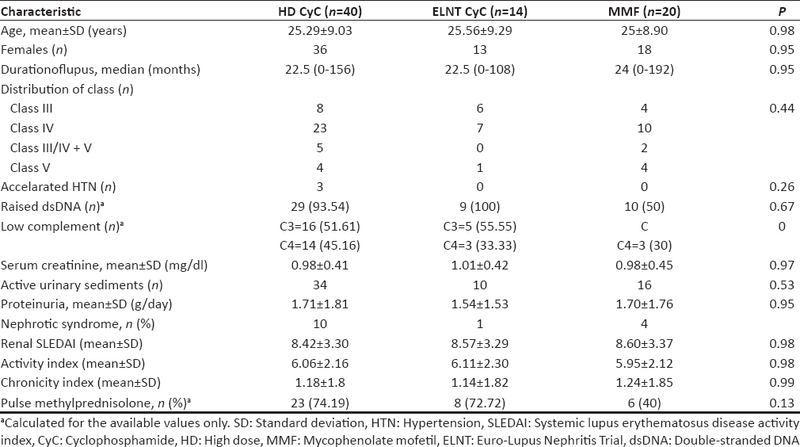 Complete response rate was higher in the individuals who received cyclophosphamide (HD CyC + ELNT CyC) as compared to MMF (17/34 vs. 2/13, P = 0.05). Univariate analysis of factors predicting response revealed only class of nephritis as a significant factor predicting response (complete or partial) at the end of induction therapy. Conclusion: In this South Indian lupus registry a complete response at 6 months in biopsy-proven LN was better with cyclophosphamide than mycophenolate. of cyclophosphamide improved 5-year survival to 80% among patients with Class IV LN and 86% among all lupus patients from the year 1980 onward. Therapies for LN now include cyclophosphamide [oral and intravenous (IV)], mycophenolate, azathioprine, rituximab, cyclosporine, tacrolimus, plasmapheresis, and leflunomide. Cyclophosphamide and mycophenolate are the currently proposed first-line agents for induction in LN. Various trials and a meta-analysis suggest an equal efficacy of both the drugs. A randomized, controlled trial published from North India suggested equal efficacy and safety of Euro-Lupus Nephritis Trial cyclophosphamide (ELNT CyC) and oral mycophenolate mofetil (MMF). No literature exists from India comparing the efficacy of the three different regimens available for treatment of LN – high dose cyclophosphamide (HD CyC), ELNT cyclophosphamide, and oral mycophenolate. Hence, we sought to analyze the response rate with induction regimen received. This study was conducted in the Department of Rheumatology at our institute. All patients with SLE are enrolled into lupus registry of our department. Data are populated into standard pro forma during a patient's visit. Follow-up data are recorded into extensions of this standard pro forma. All patients with biopsy-proven LN and at least 6 months of follow-up data in the registry between the years 2003 and 2013 were included for analysis. Those patients with a normal biopsy and patients lost to follow-up were excluded from the analysis. The following data have been collected from the lupus registry for each patient. Demographic variables such as name, age, and gender. Clinical details such as age at onset of lupus, age at onset of LN, and blood pressure (systolic blood pressure and diastolic blood pressure) at the onset of LN. Laboratory values including urine examination (dipstick albumin, active sediments – red blood cells, white blood cells, and casts) and protein quantification (24 h urine protein and spot protein creatinine ratio). Serologic data such as anti-double-stranded DNA titers, complement (C3, C4) levels at the onset of LN, and completion of induction regimen. 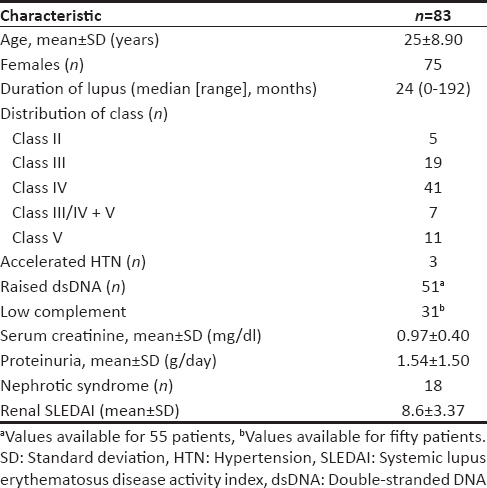 Renal biopsy – class of nephritis, activity, and chronicity index. Treatment received – whether pulse steroid was given prior to starting oral prednisolone or not, induction therapy given – ELNY CyC, HD Cyc, MMF or any other drug received, and interruption of induction therapy (adverse effects, default). Follow-up data including flares (mild, moderate, severe), maintenance regimen received, and time to first flare. Missing data were collected retrospectively from patient's records. Lupus nephritis was classified as per the ISN/RPS 2003 classification for LN. Protocol of ELNT was as follows; cyclophosphamide (ELNT CyC): 500 mg IV once every 2 weeks for a total of 6 doses. regime of HD CyC was 500–1000 mg/m 2 IV once a month for 6 doses. Induction therapy with MMF was 2 g daily orally for 6 months. In pulse steroid therapy patients had 1 g methylprednisolone IV daily for 3 days. The response was defined as per the American College of Rheumatology response criteria for proliferative and membranous LN as follows; complete response: Urinary protein: urinary creatinine ratio is <0.2, partial response at least 50% reduction in the urinary protein:urinary creatinine ratio and the urinary protein:urinary creatinine ratio is 0.2–2.0. Primary outcome of this study was response rates (complete and partial) as assessed at 6 months and secondary outcome was factors predicting response. All continuous data are expressed as mean ± standard deviation or median with range. Categorical data are expressed as a percentage. Baseline characteristics were compared between the three groups (HD CyC, ELNT CyC, MMF) with unpaired t-test/Chi-square test. The difference in outcome measures was analyzed using the Chi-square test or Fisher's exact test. Univariate analysis of the factors predicting response was done. All analysis was done using GraphPad Prism version 6.0 (Available online at http://www.graphpad.com/). This study was approved by the Ethics Committee of our institution. All patients had given their consent for their details to be included in the registry. A total of 83 patients were included for analysis. Baseline characteristics of the cohort are as shown in [Table 1]. Of the remaining 78 patients; two patients received azathioprine, one received modified ponticelli, one cyclosporine, forty patients HD CyC, 14 ELNT CyC, and twenty patients MMF. Baseline characteristics between the three groups were comparable [Table 2]. The mean dose of MMF given was 1.92 ± 0.24 g/day. The response rate was similar between the three groups. 30/40 in the HD CyC group, 12/14 in the ELNT CyC group, and 15/20 in the MMF group responded at the end of induction (P = 0.69). Complete response rate was higher in the individuals who received cyclophosphamide (HD CyC or ELNT CyC) as compared to MMF (17/34 vs. 2/13, P = 0.05). Univariate analysis of factors predicting response revealed only class of nephritis as a significant factor predicting response (complete or partial) at the end of induction therapy. Patients with a mixed class (III/IV + V) were more frequently nonresponders than those with pure Class III or Class IV [Table 3]. This study compares the efficacy of different induction regimens in LN. There is enough evidence from the West to suggest that HD CyC, fixed dose CyC, or MMF 3 g/day are equally efficacious in inducing remission in patients with LN., Similar literature is not available from India. Indians have also been underrepresented in multicenter trials like the ALMS trial for LN. Asians included in the ALMS trial were predominantly from the oriental countries, while it was believed that South Indian population is probably indigenous or related to the Aboriginal population in Australia. Hence, the results of the above studies cannot be extrapolated to South Indian population. Moreover, as compared to previous trials in LN from the West, our patients had a lower mean serum creatinine and lower mean proteinuria. Literature from India is limited on therapy outcomes in LN; these have been summarized in [Table 4].,,,,,, In the randomized trial, Rathi et al. have suggested comparable efficacy and safety of ELNT CyC and oral MMF. Baseline characteristics of our patient cohort are comparable to patient characteristics in this trial except for a lower mean proteinuria. In the present study CyC and MMF had equal response rates at the end of induction, though CyC showed better and statistically significant complete response rates than MMF. Adequate follow-up data were not available for all patients to assess long-term response to these drugs. Mycophenolate had more adverse effects resulting in frequent induction interruption than CyC, the most common adverse event being infection. Gastrointestinal adverse effects are usually not reported by our patients on MMF. This could mean a higher dose of mycophenolate may be tolerated by this patient population which could result in higher response rates. Having said this, it is a fact that financial constraints restrict the use of mycophenolate in our practice, the economics of which have been highlighted in the paper by Rathi et al. In a study conducted by Austin et al., proliferation on biopsy with 50% or more cellular crescents and less extensive cellular crescents plus moderate to severe interstitial fibrosis predicted poor renal outcome. Serum creatinine, hematocrit, race, and kidney pathology data emerged as independent predictors of poor renal outcome. A study from India suggested low C3, hematuria, hypertension, creatinine, lack of remission, and occurrence of major infection as factors predicting the poor outcome on the long-term in LN. In our study, proliferative LN (Class III + IV) predicted response. However, no other clinical, laboratory, or treatment-related parameters were found to predict response. Our study has certain limitations. First, there was an unequal distribution of patients in the three treatment groups with an overall small sample size. As most of the patients undergoing treatment in our center had financial constraints, CyC remained the most commonly used induction agent. Second, strict compliance to an adequate dose of MMF cannot be vouched for as the data was collected from a registry. The strength of our study, however, is that it is a registry data which reflect a more practical situation than clinical trials where the inclusion criteria are strictly defined hence a large group of patients is excluded from the study. In conclusion, cyclophosphamide demonstrated better complete response rates than mycophenolate at the end of induction and it remains a widely used drug in our and similar settings. Studies with higher doses of MMF compared to CyC with a longer follow-up from an Indian population are warranted. Lightstone L. The landscape after LUNAR: Rituximab's crater-filled path. Arthritis Rheum 2012;64:962-5. Hahn BH, McMahon MA, Wilkinson A, Wallace WD, Daikh DI, Fitzgerald JD, et al. American College of Rheumatology guidelines for screening, treatment, and management of lupus nephritis. Arthritis Care Res (Hoboken) 2012;64:797-808. Rathi M, Goyal A, Jaryal A, Sharma A, Gupta PK, Ramachandran R, et al. Comparison of low-dose intravenous cyclophosphamide with oral mycophenolate mofetil in the treatment of lupus nephritis. Kidney Int 2016;89:235-42. Renal Disease Subcommittee of the American College of Rheumatology Ad Hoc Committee on Systemic Lupus Erythematosus Response Criteria. The American College of Rheumatology response criteria for proliferative and membranous renal disease in systemic lupus erythematosus clinical trials. Arthritis Rheum 2006;54:421-32. Appel GB, Contreras G, Dooley MA, Ginzler EM, Isenberg D, Jayne D, et al. Mycophenolate mofetil versus cyclophosphamide for induction treatment of lupus nephritis. J Am Soc Nephrol 2009;20:1103-12. Houssiau FA, Vasconcelos C, D'Cruz D, Sebastiani GD, Garrido Ed Ede R, Danieli MG, et al. Immunosuppressive therapy in lupus nephritis: The Euro-Lupus Nephritis Trial, a randomized trial of low-dose versus high-dose intravenous cyclophosphamide. Arthritis Rheum 2002;46:2121-31. Moorjani P, Thangaraj K, Patterson N, Lipson M, Loh PR, Govindaraj P, et al. Genetic evidence for recent population mixture in India. Am J Hum Genet 2013;93:422-38. Annavarajula SK, Murty KV, Prayaga A, Das U, Desai M, Narain CA. The outcome of proliferative lupus nephritis with pulse cyclophosphamide therapy. Indian J Nephrol 2011;21:160-5. Das U, Dakshina Murty KV, Prasad N, Prayag A. Pulse cyclophospamide in severe lupus nephritis: Southern Indian experience. Saudi J Kidney Dis Transpl 2010;21:372-8. Sircar D, Sircar G, Waikhom R, Raychowdhury A, Pandey R. Clinical features, epidemiology, and short-term outcomes of proliferative lupus nephritis in Eastern India. Indian J Nephrol 2013;23:5-11. Dhir V, Aggarwal A, Lawrence A, Agarwal V, Misra R. Long-term outcome of lupus nephritis in Asian Indians. Arthritis Care Res (Hoboken) 2012;64:713-20. Abraham MA, Korula A, Arun KN, Jayakrishnan K, John GT, Thomas PP, et al. Treatment of diffuse proliferative lupus nephritis: An Indian experience. Natl Med J India 1997;10:273-5. Hari P, Bagga A, Mahajan P, Dinda A. Outcome of lupus nephritis in Indian children. Lupus 2009;18:348-54. Chan TM, Li FK, Tang CS, Wong RW, Fang GX, Ji YL, et al. Efficacy of mycophenolate mofetil in patients with diffuse proliferative lupus nephritis. Hong Kong-Guangzhou Nephrology Study Group. N Engl J Med 2000;343:1156-62. Austin HA 3rd, Boumpas DT, Vaughan EM, Balow JE. 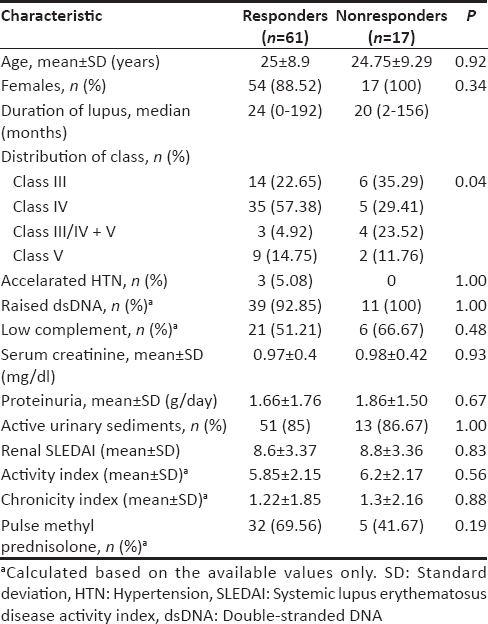 High-risk features of lupus nephritis: Importance of race and clinical and histological factors in 166 patients. Nephrol Dial Transplant 1995;10:1620-8.